Geeking out with robots, videos, news and code. Posted by emiliekopp in robot fun. April 1, 2010 – Austin, Texas – National Instruments is known for providing design, control and test solutions to engineers around the world. Additionally, NI is known for creating easy-to-use graphical programming for domain experts in every industry from robotics to green to medical. And stakeholders know NI for its long-term planning. The company’s lasting view, known as the “100-year plan,” looks decades into the future to ensure the needs of these stakeholders are given appropriate consideration. To fully execute on this initiative, the management team chose to create a plan that will actually be around for all 100 years. 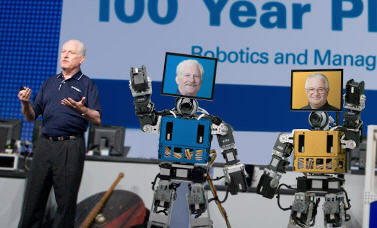 Today the company is unveiling robotic clones of founders Dr. James Truchard and Jeff Kodosky. Introduced by NI CEO and cofounder, Dr. James Truchard, the 100-year plan balances the long-term NI vision with short-term goals and defines which company philosophies, ethics, values and principles are necessary to guide the company’s growth through future generations. Powered by LabVIEW Robotics, the JT-76 and the JK-86, respectively, are ready for anything that comes their way, be it design challenges that threaten cost overruns or intergalactic overlords seeking to enslave the human race. Read more from the news release here. Needless to say, the entire company is buzzing with this latest news. Will the rest of the leadership team also be migrated to robot clones? Will the robots be programmed for good or evil? Are the cyborgs’ artificial intelligence VIs open source and will they be shared on the LabVIEW Robotics Code Exchange? And does anyone else think the cyborgs have a striking resemblance to MiNI-Hubo? I, for one, welcome our NI robot overlords. Awhile back, I learned about the 3 D’s of Robotics from Dr. Al Wicks, Director of Virginia Tech’s Modal Analysis Laboratory (MAL) and golf-dynamics-extrodinaire. He said that a robot’s purpose was to do things that were either Dull, Dirty or Dangerous to humans. Meaning, if it’s boring, gross or puts a human’s life on the line, that’s typically when a robot is designed to take care of business. So I scratched my head when I read that Taiwan University has cast robots as leads in their production of The Phantom of the Opera. “The lead bots (named Thomas and Janet) can both walk, and have silicon facial “muscles” that help them mimic human expressions and mouth movements.” Whoa. I’m struggling to think which one of the 3 D’s these robots should fall under.